Organ Trails retro graphics perfectly fit with the inventory management sim this game portrays. It ensures you’re not dazzled by the graphics and instead focus on the gameplay itself. 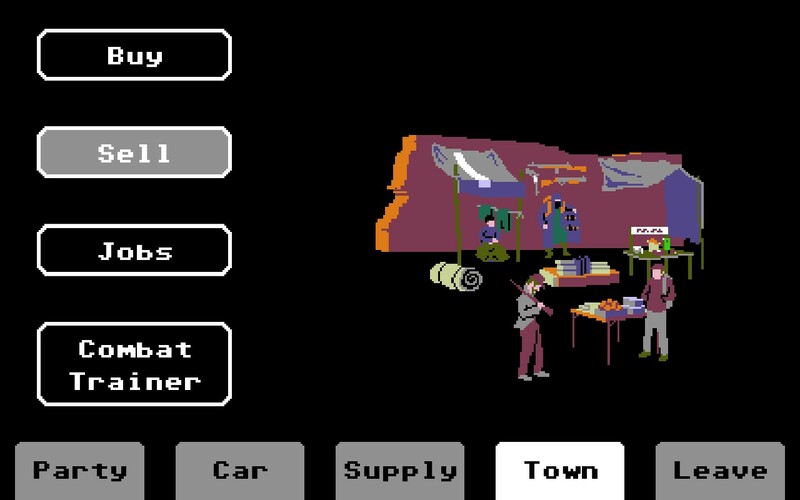 Organ Trail is a fantastic inventory management sim, one that scales back all graphics and polish to be as raw as possible. It’s a strategy game at it’s best, making sure you’re not distracted by anything else but the task of keeping your party alive. 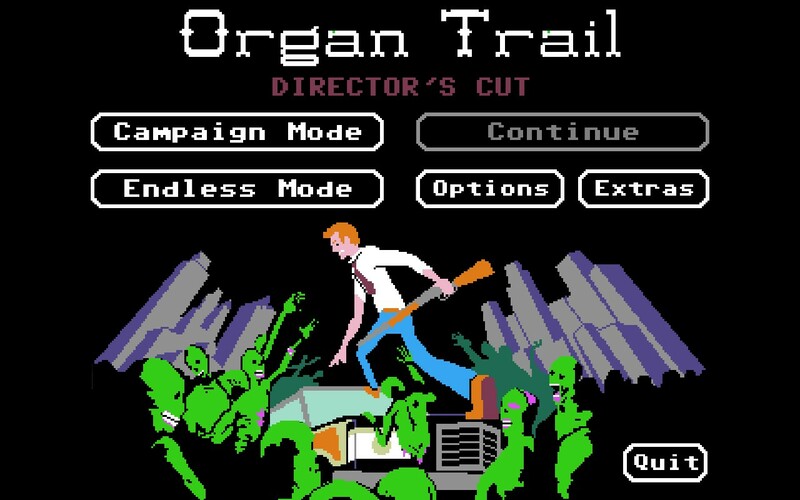 You start Organ Trail shooting down zombies from the safety of a sandbag wall, mowing them down one by one until you run out of ammo. This triggers for a man to come out of the shadows and help you run down the last of the danger. You’re told that he can help you get to Washington DC, a place where your friends probably are. (A lovely side note here, you get to name your friends, which is hilarious further down the road when things start happening.) Once there, you’re tasked with scavenging items that will try and last you the rest of the game, travelling from east coast to west. This is not a easy task, as you’re told from the gentleman’s journal that everything is pretty essential, for example, food is consumed at a regular rate to keep the party alive over the rest of the game. allowed your party only 1oz of food an hour will make your supplies last longer, but causes your party to lose more health by the hour. Once you’ve decided on your resources, you set out without the gentleman who helps you, killing him due to being bitten and infected. He has served his purpose and has helped you start your journey. This is what the town screens look like when you reach a new area. From here you can decide what you’re going to need for the next leg of your journey, and equip yourself appropriately. The town screen also gives you the chance to earn more money through jobs, or upgrade your car to ensure it survives longer. From here, the rest of the game is relatively similar. You travel along in your station wagon from town to town, having random encounters along the way. These encounters can be nice, giving you a new upgrade part for example, or very, very annoying (I once lost all my spare tyres and mufflers in one trip, whilst also having a team mate incapacitated). This is where the inventory management comes into action; you’re constantly having to manage healing squad mates, with ammo, and spare parts for the car to ensure you get to the next town in one piece. I must say one thing, for a post-apocolyptic society, a lot of people want cash, to the point I found myself far too short on the resource too many times to count, so keep that in mind when you start this game yourself. This is what happens along the road. I assure you, this is the start of the game as I certainly didn’t do this good a few minutes in. 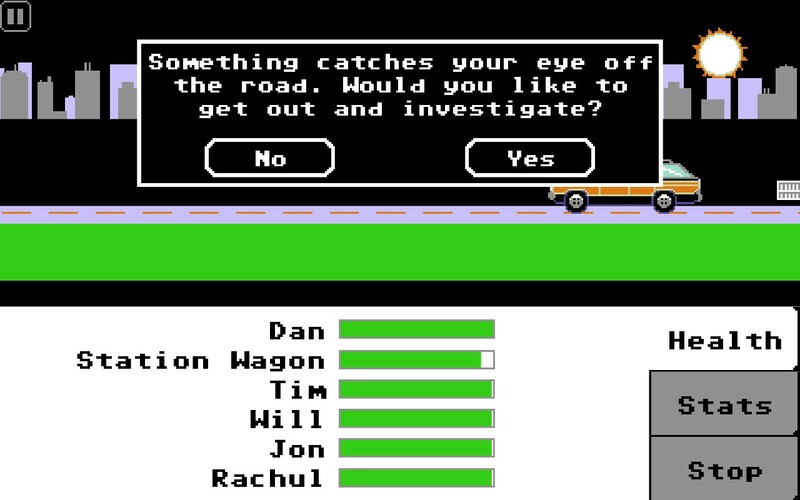 For as much fun Organ Trail is, it’s not without its flaws. The aiming for example during stand offs isn’t fantastic, but this could jus be a conscience decision for the developers to ensure the game stays hard. Another problem is the games simple mechanics; past the inventory management and player management, there isn’t much originality to the towns and encounters. It means you get into a routine and generally do the same thing over and over. In conclusion, I would compare Organ Trail to FTL: Faster Than Light. Its game mechanics make sure you’re constantly managing a set crew and vehicle down to the nitty gritty, and events make sure it adds some randomness into the mix. Add this to the fact that like FTL, Organ Trail is a hard but addictive game, and it becomes impossible not to recommend Organ Trail. Its graphics and play style might not be to everyones taste, but if you’re a fan of strategy and hard games, Organ Trails right up your street.